This plain tan cardboard box with black printing contains all 20 rounds of full metal jacket ball 30.. 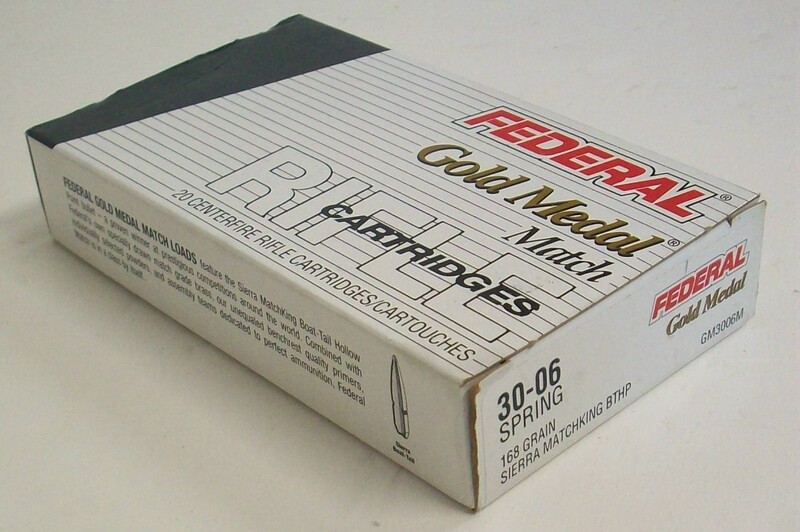 This Federal Cartridge Co white, blue, red and gold cardboard box contains all 20 rounds of 168 grai.. This FM manufactured white, yellow and green cardboard box contains all 15 rounds of pointed soft po.. This Hornady box contains all 20 rounds of 165 grain FTX 32 Spl ammunition and is in very good to ne.. This Norma manufactured cardboard box contains all 20 rounds of 150 grain semi-pointed soft point 7x.. 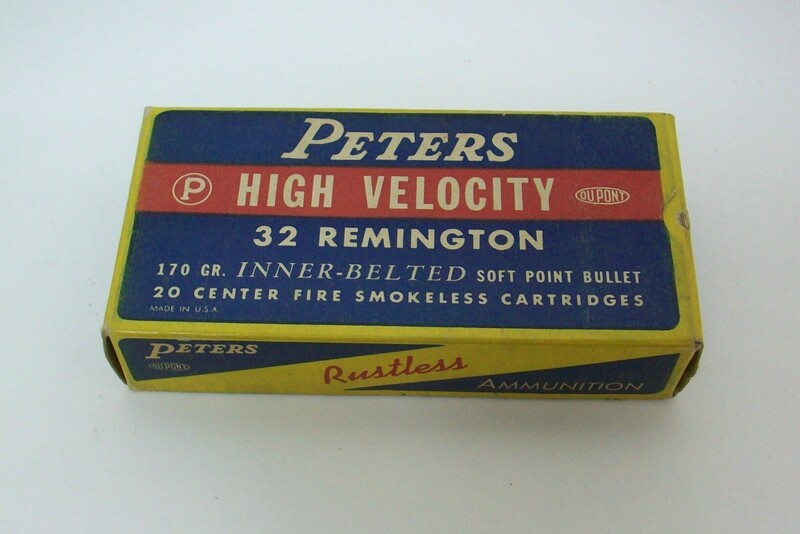 This Peters Cartridge Division High Velocity blue, red, yellow and white cardboard box contains all .. This Remington green, white and red cardboard box contains all 50 rounds of 46 grain jacketed hollow.. 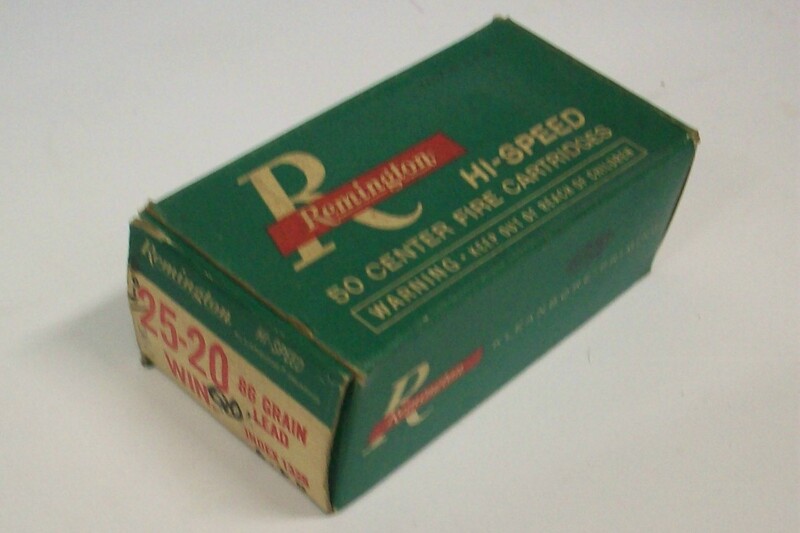 This Remington manufactured cardboard box contains 33 of the 50 rounds of 86 grain lead 25-20 rifle .. 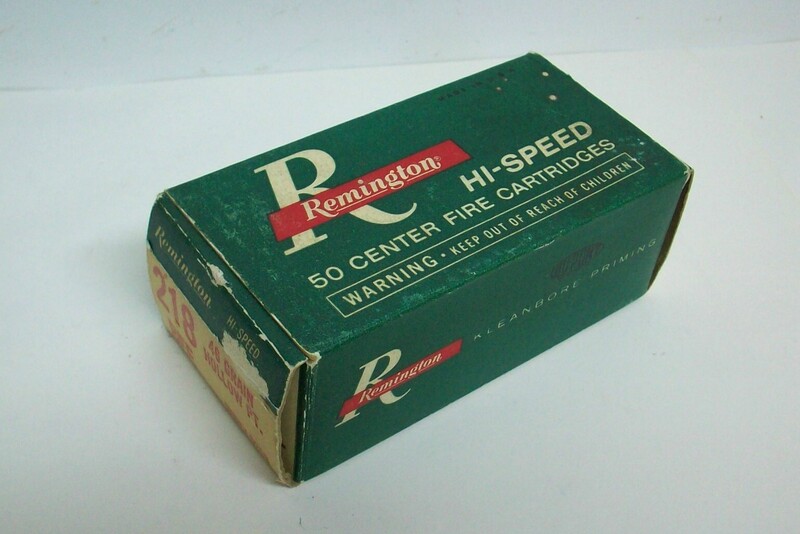 This Remington manufactured cardboard box contains all 20 rounds of 150 grain soft point 30-30 rifle.. 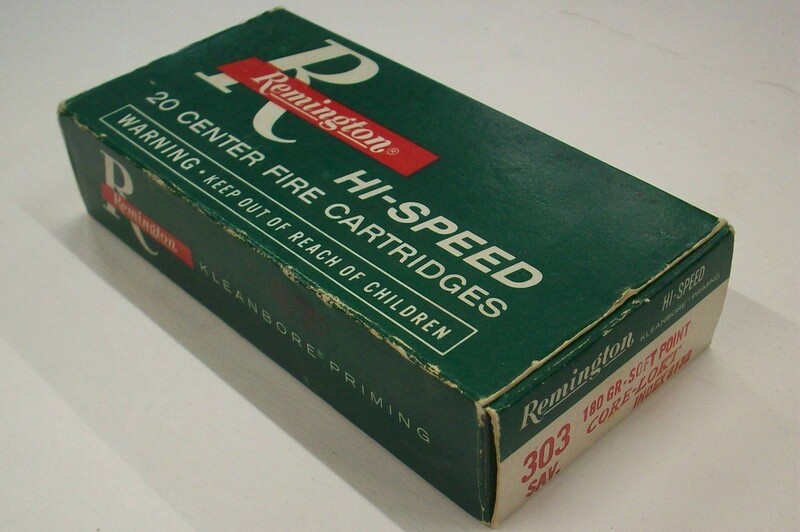 This Remington manufactured green, red and white cardboard box contains all 20 rounds of 180 grain s.. This Remington UMC manufactured green and red Kleanbore cardboard box with the dog bone design conta.. This Union Metallic Cartridge Company two piece cardboard box with a green top label and light orang.. Manufacturer: Union Metallic Cartridge Co. 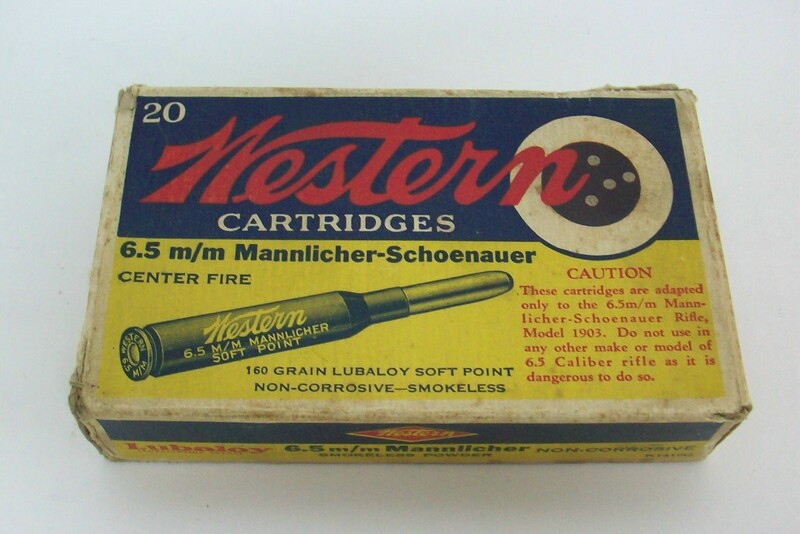 This Western Cartridge Company manufactured yellow, blue & red cardboard box contains all 20 rou.. This Western Cartridge Company manufactured yellow, blue & red Super-X cardboard box contains al.. This Western Cartridge Co. manufactured yellow, blue, and red Super-X cardboard box contains all 20 .. This Winchester two piece cardboard box with dark reddish / burgundy labels and black printing is de.. 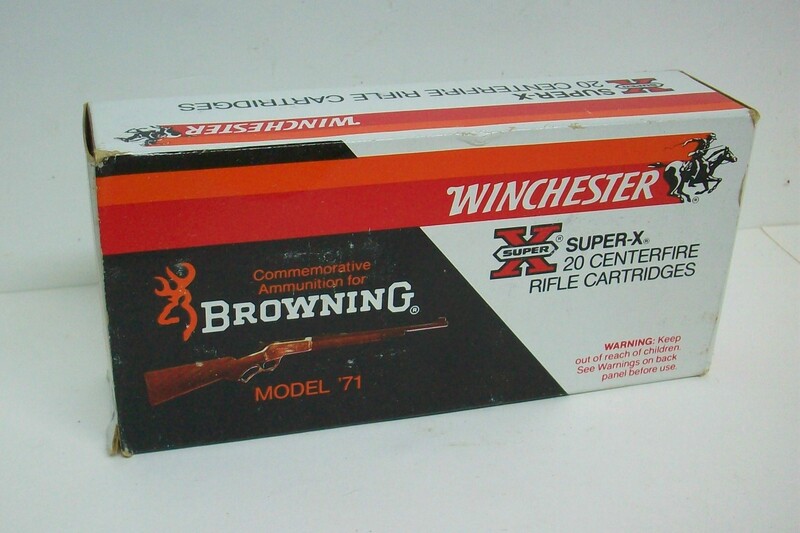 This Winchester manufactured red and yellow cardboard box contains all 20 rounds of 200 grain soft p.. This Winchestere commemorative ammunition box was manufactured for the antlered game commemorative c.. This Winchester manufactured white, red and orange cardboard box contains all 20 rounds of 55 grain .. This Winchester manufactured cardboard box with the Browning Model 71 rifle design contains all 20 r.. This Winchester tan cardboard box with brown and black printing was manufactured to compliment the c..
We provide original gun parts, collectible firearms, and related merchandise with integrity, quality, and service, which are the strengths of our business. We focus primarily on original factory manufactured parts with minimal wear for obsolete firearms, but also stock parts for modern firearms as well as a limited number of reproduction parts. Our company will continue making changes to improve customer service, the ease of ordering, and the quality of merchandise for you, our customers. Thank you for visiting our website. Notice: We are a "Mail Order Only" company and do not have a show room or location for the public to pick up merchandise. Copyright © Classic Firearms & Parts LLC. All rights reserved. Site Map. Website by Rock Solid Results.